This month, I’m featuring my Lavender soap. I’ve always loved lavender. The scent is soothing and the color is vibrant. In my first lavender soap, I wanted to put whole lavender buds in. 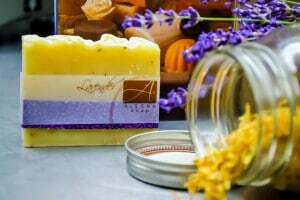 Problem is, the lavender turns brown in cold process soap due to the high pH. The soap was filled with large brown spots. Not pretty at all. So I used a coffee grinder and added the ground lavender and this is the result. I love the speckled look, don’t you?